How to Choose The Best Decoration For Your Fish Aquarium. If you’ve just purchased a fish tank, chances are that you are really looking forward to decorating it. This is your chance to get creative and let artistic side out. There are a plethora of design options you could go for, with each aspect bringing something different to the table. There is no limit to what you can do. The secret is to decorate your aquarium in a way that complements the type of fish you have as well as the décor of your room. Keep in mind that less is more. You want decorations that add colour and life to your tank but you don’t want to overdo them either. Your objective is to highlight your fish by giving them an eye-catching setting to thrive in. The background and lighting of your fish tank will make or break its look. Many people don’t realize just how important these two are. Remember, your background and lighting will both reflect off the water. So, when done right, you can create some mesmerizing tones of colour in the water. White or blue lights work well in most aquariums, but you can always experiment with different hues and backgrounds. Some of you might like colours that pop, while others might like more serene backgrounds. Additionally, these two factors also dictate the perception of space in your tank. 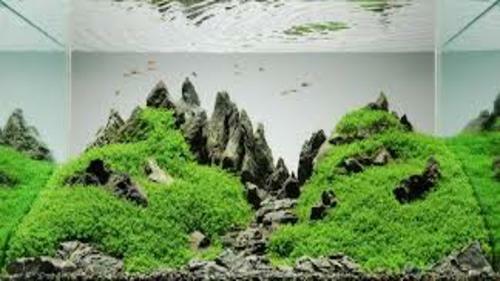 Proper usage can make your aquarium look much larger than it actually is. 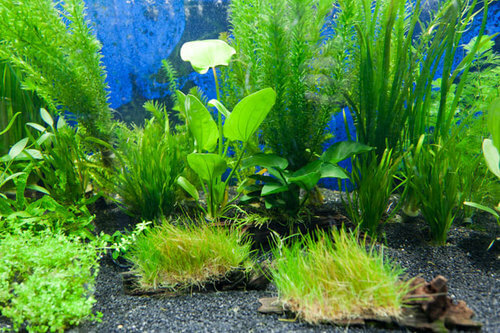 Once you have decided on the background and lighting of your aquarium, the next thing to do is select a substrate. The type of substrate to select depends primarily on the kind of fish you plan to keep. Some fishes like to bury themselves in sand or lie along sandy bottoms, so you want to give them a sandy substrate. Sand is also preferable if you plan to keep saltwater fish. For freshwater fishes, it is best to go with gravel or stone. Next, you want to consider the look you want for your fish tank. Substrate is available in a variety of colours. Go for natural colours like brown for sand or white stones if you want your aquarium to mirror nature. You can go for something out of the box if you think you can pull it off. Substrate like glass pebbles are an interesting option. Firstly, is the substrate suitable for your fish? Secondly, will it go with your other decorating plans? This is important because you can’t have live plants growing on gravel or glass pebbles – they need sand. If you’ve ever visited a pet shop, you know that there is a wide variety of decorations that you can out inside your aquarium. From driftwood to rocks, figurines to fake coral, treasure chests, wrecked ships, starfishes, etc., you are spoilt for choice. Pick any decoration you want as long as you don’t clutter. A general rule of thumb to follow would be to not have more than 3-4 items in a medium-sized tank excluding plant life. Also only use decorations that have been specifically made for underwater use. Otherwise, they might dissolve or contaminate the water and harm your fish. Plants are the backbone of most aquarium decors. Whether it is live plants or synthetic ones, there is nothing that can compare to the elegance that plants can give to a tank. Live plants provide oxygen, regulate pH levels and help purify the water. The flipside is that like all living things they die. They shed leaves, discolour and need regular maintenance. Leave a deaf leaf floating around in your aquarium for too long and you’re inviting all sorts of bacteria. This is where plastic plants can make your life much easier. Since they are synthetic, they require minimum upkeep and look fresh all the time. Plus you can select any shape and colour of plant you want without worrying about them dying on you. Keep the above mentioned tips in mind and you shouldn’t have any problems choosing the best decorations for your aquarium. The rest is a matter of personal taste. There are so many decorations out there that you can’t really go wrong. Stick to what you like and you should be good.